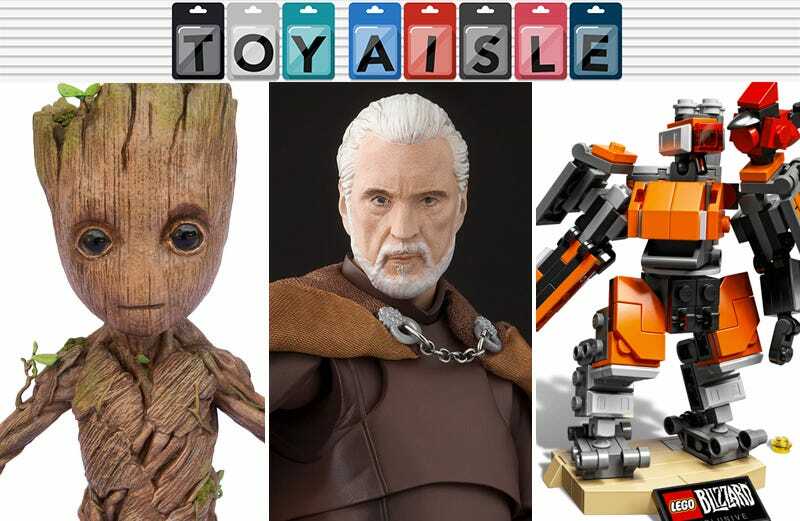 Welcome back to Toy Aisle, io9's weekly round-up of the coolest toys we’ve seen draining our wallets for a perpetually growing list of preorders. This week: Bastion the robot gets turned into Lego! Hot Toys is making an Infinity War meme a very expensive reality! Groot gets a disturbingly detailed puppet! And more! Overwatch, Blizzard’s delightful multiplayer shooter about scientists, oddities, and other assorted heroes and villains taking part in the ancient art of pushing a payload back and forth between each other, is coming to Lego very soon. But before a complete line of sets based on the game comes out, Blizzard have teamed up with the company for an early teaser of what fans can expect, in the form of...well, one-time-target of the entire playerbase’s ire, Bastion, the omnic robot soldier/walking turret known as the bane of new players. Although eventually realized as a CG model by visual effects artists, on set the other Guardians of the Galaxy performers needed a visual reference when interacting with the tiny character. So Marvel created a tiny but immaculately-detailed puppet version of Groot, which was performed by the studio’s own prop master, Russell Bobbitt, while filming the sequel. Disney is now making 150 replicas of that same puppet, made with soft rubber and custom 3D-printed adornments, that will ship in a thoroughly padded protective Pelican case. Why the overkill? Each replica costs a staggering $2,550, so would you really want your local Fedex delivery person tossing around a cardboard box with your prized possession inside it? Hot Toys long march through the ginormous cast of Infinity War continues with a welcome update to Bucky Barnes. Including a new sculpt depicting the scruffy, long-haired version of Bucky seen recovering in Wakanda after the events of Civil War, the new 1:6 scale Bucky comes with his new costume (and swanky Wakandan cyborg arm), the requisite zillion extra hands, and his fancy machine gun that Rocket Raccoon covets. Ryan Reynold’s star power didn’t do much to help his Two Guys, a Girl and a Pizza Place co-star Richard Ruccolo’s career, but as Deadpool he’s managed to bring renewed interest to the X-Men universe’s Cable—which Mezco Toyz is eager to cash in on with its new One:12 Collective 6 1/2-inch Cable figure. With over 30 points of articulation, eight swappable hands, light-up chest armor, plus a plasma cannon and grenade launcher, the only thing missing is a tear-jerking teddy bar hanging off his belt. If you ever looked at a set of pre-LED Christmas lights and thought the long bulbs looked like tiny lightsabers, you’ll no longer need to rely on your imagination to make that a reality. ThinkGeek is now selling a 10-foot long string of 20 red and green miniature glowing lightsabers, with blades about 3 1/2-inches long. They can be hung up literally anywhere since they’re powered by a tiny box packed with three AA batteries—no power outlet access required. At $30 for each strand, covering an entire tree with these is an expensive proposition, but who cares about money when you’ll undoubtedly have the most amazing Christmas tree on the block? Merchoid’s been pumping out novelty holiday sweaters like there’s no tomorrow, but $70+ for a top you can maybe wear to two or three parties is hard to justify. You’re better off going with this Harry Potter Hogwarts knitted sweater featuring floating candles that all light and flicker up thanks to a web of hidden LED bulbs. For $72 it can be worn all through October leading up to Halloween, and then from November to December right up until Christmas day. If you’re imaginative enough, you can probably even find a reason to wear it to Easter dinner, on St. Patrick’s Day, and every time you go see a new Harry Potter movie. Because board games like Operation and Perfection aren’t already stressful enough, Yulu Games has created a ‘fun’ simulation that has players racing to defuse a $25 make-believe bomb. Cut The Wire plays exactly as it sounds, using clues that flash on the screen, each player tries to figure out which of the game’s many wires will deactivate the bomb, while trying to avoid the one that immediately detonates it. It’s like Operation meets The Hurt Locker, minus the catastrophic finale of the latter if you lose.